When we last visited this topic in my previous post, I was describing the horror of the refrigerator in the new house, and having to totally scrub it out and sanitize it as the movers were underfoot, unloading everything we owned. The whole process of having movers touching everything we own is enough to put my introverted self into overload anyway; add this little discovery, and I think I went into survival mode. Eventually, we got the kitchen to a point that it was usable. The movers left once everything was unloaded and we were left there alone to reflect. The smell was so bad. So very bad. We weren't even sure where to start on making it better. We left windows open a lot and hoped that with every day the cats were gone, the smell would diminish. To a point, it did. But not nearly enough. Meanwhile, fall was in full swing, complete with chilly nights, so we were just wasting heat. Which kind of added insult to injury. We didn't know it at the time, but this was the start of a two-month period of smelling cat pee. ALL. THE. TIME. First thought when your eyes open in the morning? Ew, cat pee. Walk in from work after a long day? Bam, cat pee. Step out of the shower? Ugh, cat pee. Flop into bed at the end of the aforementioned long day? Cat pee. It was awful. As I type this, it occurs to me that it might sound a little diva-ish. Let me assure you, I am no diva. My standards of cleanliness are not all that high, really. I grew up playing in the woods in Alaska. I'm okay with things being a little dirty or even a little smelly. But this? This was like nothing else I had ever experienced. Everything just felt dirty and gross. And quite frankly, moving into this house was supposed to cap off the whole experience of buying the house, which was not extremely easy or pleasant. I had to do a lot of footwork on things that were other people's jobs. There were a lot of things that fell through the cracks, that I ended up having to work double time to take care of, to make sure we could close before the seller left the state. The lender overpromised and underdelivered throughout the whole process. The title company completely miscalculated all the closing costs, which if I hadn't caught, would have cost us $8,000 we just didn't have. It was just kind of a stressful process, and what kept me going through all of that was that at the end of August, we should be moving into our beautiful new house and living happily ever after. Years ago, I had a therapist tell me that one of the most dangerous words in the English language is "should." She was right. So, fast forward a few days from move-in day. We were in a place of deep regret, severe irritation and just generally helpless feelings. We were tired from the move and everything that goes with that, and unlike other moves, we didn't have the immediate payoff of basking in the glory of a new home right from moving day. Instead, we got irritated sinuses and burning eyes from the smell. We felt like we had just made the biggest mistake ever - which is not a good feeling alongside a new mortgage payment. We turned away family and friends that we had promised to invite over right away to see the house, even before we really unpacked. It was embarrassing even though we knew we didn't cause the problem. We had exhausted most of our on-hand savings to pull off this house purchase and the move. We did not have the time, money, or desire to deal with trying to eliminate the cat pee smell. However, we were faced with a choice: figure out how to fix it, or smell it. Intensely. ALL. THE. TIME. Obviously, this was no choice. We had to figure out how to fix it. We had used most of the vacation time we had left for the move itself, so for the next two months we spent evenings and weekends... dealing with this. Not ideal at all, but you do what you have to do, right? Despite having just been professionally cleaned twice in a week, including being 'flooded' with cleaner and enzyme, it was obvious that the biggest portion of this problem was coming from the carpet in the living room. The appearance and smell of this carpet was pretty bad. This is that stretch of four or five feet along the wall by the fireplace. Because it's so well-lit, it's not quite as obvious in the picture as it was in person. But you can see it's well-anointed... and this was after those cleanings. The cleaning expert had told us to give it a few days for the enzyme to work fully, and that it should improve over that time. So we waited. Some days were better than others. If we kept it cool in the house, it wasn't quite as bad. If the sun happened to hit the floor in that room for a couple hours in the afternoon, it was like an oven effect. The smell became so intense that it was worth wasting all the heat to flush out the air in the house when we came home from work. We tolerated this for close to a month while trying to develop a routine, mostly for the kid. He had changed preschools in June and then changed houses in August, so we wanted to quickly get his routine re-established. It was tough since we really couldn't put much in the living room due to the fact the carpet was destroyed. The dining room and kitchen were full of boxes and we ate our meals at a card table wedged into a walkway, but we survived. 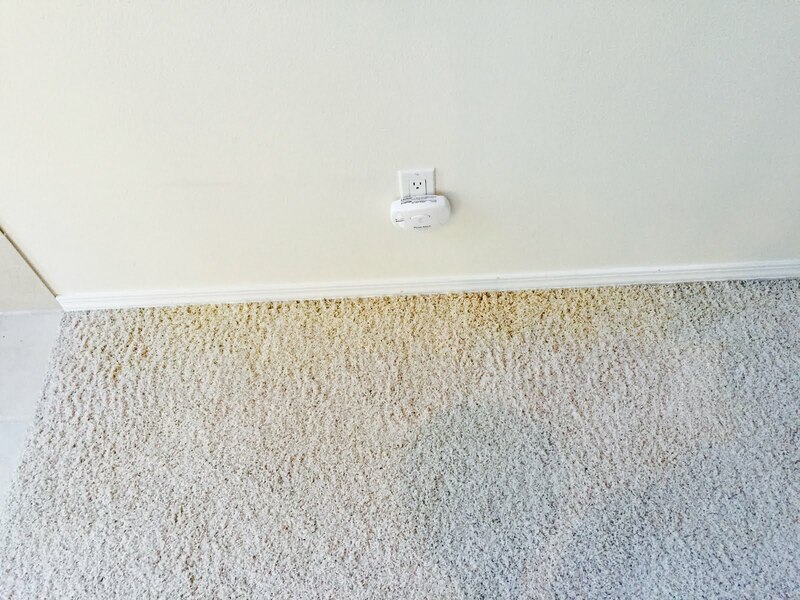 I had contacted the seller and told her the carpet was much worse than we originally thought. She processed that for an hour or two and then told me that when she reached her new home, she would be mailing us a check to cover new flooring. We were very grateful for that. You can see all the cat pee stains on the backside of this carpet. It was a bit gag-inducing. We knew it was bad, but we didn't know it was quite this bad. This next one shows the section that was along the wall (in the 'before' picture above). The holes from the tack strip are even stretched and distorted from being soaked so often, or for so long, or both. We're not sure. Soon, he had all the carpet up. 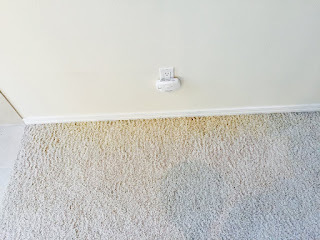 Next he had to remove the trim around the base of the walls (which I have heard people call baseboard, but to my Alaskan brain, baseboard means a baseboard heater...), but remember that saturated stretch along the one wall? When he pulled the trim off, guess what he found behind it? He pulled that off, and guess what he found? Oh, yes. That is wood. WET wood. Wet to the touch. Saturated. With CAT PEE. The cat had been gone for over a month by this point. We were shocked and horrified. No wonder we hadn't been able to get rid of the smell. But the bigger issue was, how far did this go? If you've ever dealt with cat messes, you know it is very difficult to get this smell out. It takes replacing whatever is soaked, usually. This wood is at the bottom of a 17-foot-tall wall. How on earth do we replace that?!? And so began five more weeks of a new kind of frustration. Dave covered the entire rest of the floor with primer to try to lock in the smell in the rest of the floor. It helped, but not much. Most of the stench was coming from this one problem wall. We tried everything to dry this out. We ruled out the idea that it was rainwater or something leaking in from somewhere. It looked orange/brown like cat pee, it smelled like cat pee, and you could see the crystals on the surface of the wood. I contacted the seller again and told her what we had found. She replied, "sorry it's so bad, didn't know that" and then immediately and completely stopped answering any of my correspondence. I wasn't kidding about five weeks. First we tried just letting it air out for about a week. No luck. Over the next month we tried heaters, fans, and everything else we could think of. We'd leave heaters and fans on it while we were home, then turn them off when we left for work (because we're both a little paranoid of fire). It would be dry to the touch in the morning, but by the time we got home, more of it would have seeped out and it was wet again. This cycle was completely maddening. We'd been in the house two months by this time and we were still smelling cat pee, day and night. We don't have a dang cat!! Just really frustrating. The worst part was we were starting to wonder if we were ever going to get rid of it. If not, then what?!? We definitely did not have the option to rip walls out and rebuild them. The stress of the 'what-ifs' at this point was pretty intense. In sheer desperation, after having been silent about this publicly for this entire time so as to not cause drama with the seller, who we used to work with and considered a friend, and who remained friends with people we still worked with... I finally turned to social media for help. I spent literally an entire evening composing a post that would be a request for help and suggestions without mentioning her at all, without it sounding like some kind of attack or insult, without any nastiness at all. I even ran this post past Dave, who is the world's greatest diplomat and protector of feelings. He approved. I posted it. At first, I hid it from the seller, who was still on my friends list. I really didn't want to hurt her feelings, but I had to do something. I was desperate for help and I have 300 Facebook friends, many of whom are connected to the construction industry. We were down to either calling a contractor, and possibly selling our truck to pay for whatever the fix would be, or asking publicly for help. A couple of hours later, I decided it was worse to hide it from her, not to mention that one of our mutual friends would more than likely mention it to her and she'd be even more hurt. So I changed the settings so that the post was visible to her. Dehumidifiers are expensive to buy, expensive to run, and noisy. Also, they are apparently magical. It took about a week of alternating the dehumidifier, fans and heaters, we were able to declare the wood in the wall DRY!! This was nothing short of a miracle. I cried. After two months of this ordeal, I just couldn't believe it. If you haven't already, you may want to read my previous post, which is the first part of this story. If you already read it and you're coming back to read the resolution of this little cliffhanger, I'm not sure I'll get all the way to the end in this one post. We'll see. Right in the face. In the mouth. In the nose. Way up in the sinuses. Instant burning. A very strong and unmistakable odor. We glanced at each other in horror. This could not really be happening, could it? No. The first room you walk into is the kitchen. I set my keys down and leaned on the counter, kind of in shock. I think my sanity preservation instinct kicked in. I remember saying, "we just need to get some fresh air in here, it'll be fine." We ventured into the dining room and then into the living room. We were horrified all over again. The seller had mentioned that her cats had the occasional accident on the living room floor. In all our visits to the house, we mostly only smelled cat pee near the litter box, and even then it wasn't any worse than you would expect near a litter box. We did catch a couple of wafts here and there in other areas of the house, but nothing severe. Even with Dave being allergic to cats, we weren't concerned about it. We honestly couldn't figure out what happened between those visits and closing day a few weeks later. Maybe the cats got upset about the move and started retaliating on the living room floor? Hard to say. All we knew at this point was that the living room floor was extremely soiled with cat urine. There was a basketball-sized yellow spot in the middle of the living room, where a table had been. (Remember, this was our first time seeing the house empty.) There was about a four-foot section of the wall by the fireplace that was stained dark yellow from what we thought must be years of anointing by the cats. We were so in shock and so horrified that we just stood silently in the living room for a few minutes. All that kept running through my mind was, "what did we just do?!?" As we did that first walk-through of the living area and the backyard, the displeasure intensified. It quickly became clear that the "move-out clean" she had done was not at all what a move-out clean should be. The counters had dust and dirt on them. The stove had a bunch of crumbs and food remnants all over it. All of the art that had been on the walls was removed, but all the screws and nails holding it up were left in the walls and there were really dirty outlines everywhere. I don't think the walls had ever been cleaned. That wasn't all. There was a whole laundry list of things that were not as we expected. She had told us on two different occasions, without us asking, that she was going to leave the very nice patio furniture set and one of the fire pits in the backyard. Both were gone. She told us she had power washed the (large) deck in the backyard. Technically she did, but it looked like it was done by a 4 year old - still filthy. The garage door opener only worked intermittently. The dishwasher was not attached to anything, so when you opened the door, the whole appliance flopped forward. One of the living room walls was completely full of cat scratches - they were concealed before by furniture. There were random items left around the house, like a cracked vase on the back deck and a carry case for a collapsible lawn chair, and in the master bathroom, a night light that looked like a cat climbing into a toilet. (Oh, the irony.) I must say though, I was very grateful she left the shelving! The windowsill in the guest room, which had previously been too full of junk for us to really inspect, was water damaged. The kitchen cabinet shelves were missing support pegs, so they sagged in the middle. Multiple sets of bifold doors had broken hardware/guides. The walls in the master bedroom are full of cat scratches, holes, and dents/blemishes. Two of the three bedroom doors don't close properly. The motion sensor light on the back of the house, which she had said just needed new bulbs, was actually broken. The downstairs bathroom wall is damaged due to a broken toilet paper holder being allowed to scratch it all up. The master bathroom doesn't have a door. There is an extra door in the garage, but it has no doorknob? I guess you probably get the idea. It's probably good that we didn't have much time to brood on this, as the moving truck was backing up to the garage to unload. And so began a day of chaos, with the new house filling up with our belongings as planned, however now I felt sort of sick about it. I wanted to hose down the whole inside of the house with Lysol before anything we owned was unloaded. However, there was no time for that. While the movers unloaded at breakneck speed, our first priority was getting our refrigerator and freezer contents from the apartment to the new house. I flung the refrigerator door open in the new house, and immediately had to try not to gag. It was as if someone had set a bowl of cat pee in that fridge and just let it marinate for weeks. There was spilled food and brown crusty stuff all over all the glass shelves and in the drawers. It hadn't been even superficially cleaned in a very long time. I hate to say it, but I really wondered if it had ever been cleaned since it was purchased in 2007. Dave and I began frantically pulling all the shelves and drawers out of the fridge and freezer to wash and sanitize them, and the whole interior of the thing. The smell was so horrid. Our eyes and noses burned, let alone the plain ol' gross-out factor. We took turns reassuring each other that this would all work out. The house just needed to air out, we thought. Let's open some windows and doors. Let's Febreze that living room carpet until we can replace it, months down the road once the dust settles and we can afford it. Once upon a time, probably nine-ish months ago, a co-worker who was preparing to retire approached me and asked me if we were interested in buying her house. At the time, we had been in our "temporary" apartment for well over a year - longer than we'd hoped - and we were planning to wait another few months before we got pre-qualified and began house hunting, since we were in a lease. When she first asked me, I laughed. She lived in a very nice, quiet neighborhood that was in our top three choices of areas (not including the spendy houses on the hill, that is!). I told her I would love to look at buying her house, but that I was pretty sure it was outside our budget, based on neighborhood alone. And then she uttered some words that would live in infamy. "Actually, I was thinking of selling it for the amount you said was at the top of your price range, if we can do so without realtors, since that would save me a ton of money." Of course, red flags went off all over the place when she said that. But, we'd known her long enough to not be concerned about any deception or anything. The concern was more about trying to broker the sale of a house by ourselves. It seemed daunting. We had already purchased two houses before, so we basically knew the drill, but still - who would swoop in and save the day if any complications arose? A few weeks before the 'for-sure' date she gave us for a decision, we told her we were ready to move forward. Our pre-approval was ready and we both sat down at the kitchen table with the seller and filled in a blank "for sale by owner" sales contract. And so began a two-month-long process of fumbling through all the necessary steps. The inspection went very well, though I admit we weren't thrilled when we arrived for the inspection and found the inspector (whom we had chosen) was apparently an old friend of hers. He turned out to be great, though. "This is a very clean property," the inspector said to us. The grout needed to be re-done in the master shower; Dave quickly volunteered to do that himself. There were a handful of other things, nothing major, and we all quickly agreed on who was going to take care of what. The appraisal went well, too. It came in a few thousand over the sell price, which is ideal for a buyer. We were very excited. It seemed to be the final procedural hurdle. I was kind of having to micro-manage our lender's representative, as she just did not have a sense of urgency about anything, and also was missing a pretty important eye for detail. If not for my intervention, we would have been asked for a much higher amount up front at closing than we should have. I was annoyed for having to babysit the whole thing, but it was worth it. Despite some bumps in the road and some frantic phone calls, everything finally worked out and we went to closing. The seller was not leaving the state until the day after closing, so she had asked us if she could stay in the house that last night. Without hesitation we said yes. That next day, around noon, she let me know that she was headed down the highway. We were busy with the movers packing up our apartment. When they got finished, somewhere around 3pm, we finally had an opportunity to go see the house empty for the first time. I was so excited when we pulled up, I was fidgeting in my seat! Oddly, the first two things we noticed when we pulled into the driveway were a trash can next to the garage that was positively overflowing, and that the two flower baskets on the front of the garage contained dead flowers. Huh. Weird. But obviously those were little, tiny, not-worth-mentioning things. Just not the most charming welcome to our new house!